Shawnee, aka CTW Shadowcat, is a lovely 6 year old black female born August 29, 2011. Her sire is CTW Speedy Trent and her dam is Gable Pinch. According to Greyhound-Data.com, Shawnee's prolific career of 198 races started on November 3, 2013 at Wheeling Downs, WV and finished at the Birmingham, AL track on February 27, 2017. She was one heck of a competitor and now deserves to hit the retirement circuit to find her forever home. Shawnee is not cat or small animal tolerant at this time. After nearly 4 years of racing Shawnee is more than ready for retirement. She placed in the money a whopping 46% of her 198 races! Now her idea of entertainment is following her humans from room to room and waiting for ear rubs, scratches, and neck massages. Instead of being part of a pack Shawnee prefers being an only dog or with one, maybe two other large dogs. The racing instinct is still intact - kitties or smaller dogs trigger her high prey drive so she should not live with either. Shawnee has greyt leash manners and loves going for walks. She does like to play with toys every once in a while though for the most part she is content just laying at your feet. She adapts very well to your schedule, no need to worry about her waking you up on the weekend! Shawnee is fine in an apartment or in a home with a dog door. 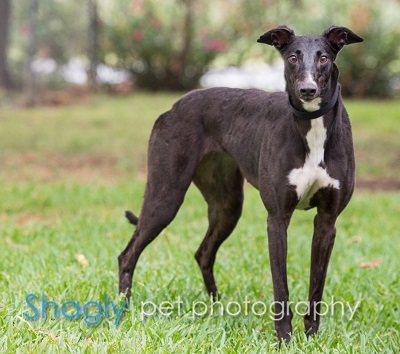 She is a good-natured girl and deserves a winning forever family.